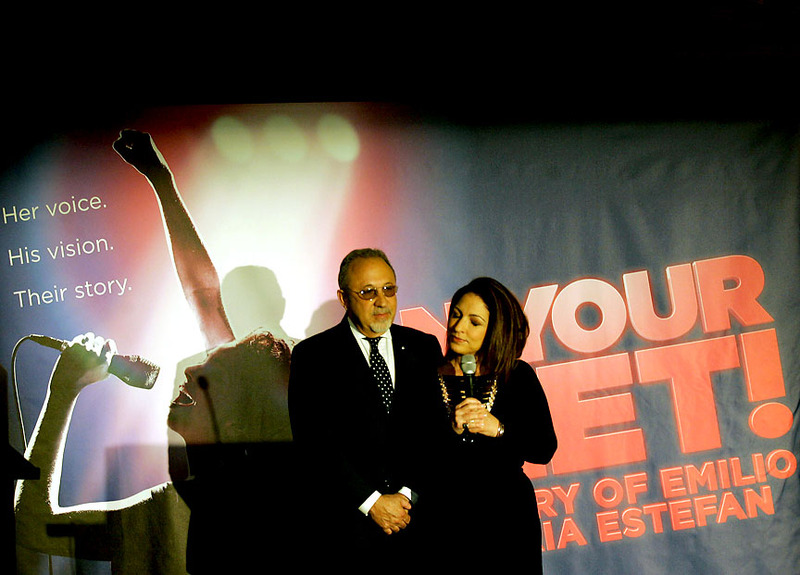 International superstar and 100 million album seller Gloria Estefan joined her husband Emilio, also a 19 time Grammy Award-winning producer/musician in his own right, at Chicago's Oriental Theatre on Tuesday to officially launch their autobiographical musical "On Your Feet!" Besides promising all the major Miami Sound Machine and solo hits ("Rhythm Is Gonna Get You," "Conga," "1-2-3," "Get On Your Feet," "Coming Out Of The Dark"), the pre-Broadway engagement will trace their inspiring journey towards the American dream, alongside their ability to bounce back after a near tragic tour bus accident. Along with the plot preview, the Estefans also introduced Ana Villafane (who makes her Broadway debut as Gloria) and Josh Segarra (who co-stars as Emilio), both of whom bare considerable facial resemblance the congenial super couple. On Your Feet! performances begin June 2 and run through July 5 at Chicago's Oriental Theatre. For additional details, visit www.broadwayinchicago.com or www.onyourfeetmusical.com. Here's Your Chance to.... Respond! Rant or Rave within 24 hours.